Bee-Bots are a wonderful tool to teach students the fundamentals of computational thinking. The small robot can remember up to 40 commands consisting of forward, backwards, left and right movements to maneuver around the floor. 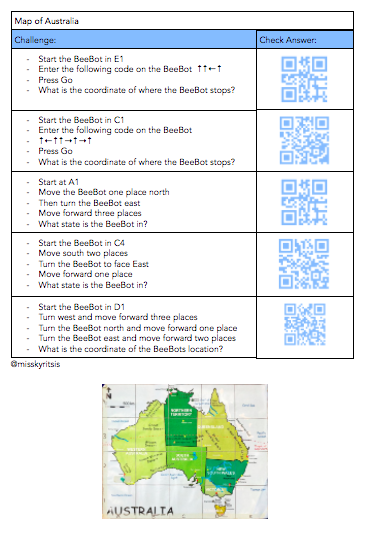 These commands develop students understanding of sequencing, computational thinking and the mathematical concepts of coordinates, distance, and location. I am a big advocate for integrating the Digital Technologies curriculum with other areas of the curriculum to create hands on learning experiences that deepen students understanding of particular skills. The Bee-Bot allows students to create, explore, and problem solve to achieve success. To begin this unit we did a recap of the compass and directional movements. We used the Bee-Bot to help students grasp this. Using Bee-Bot mats, I added masking tape to the edges to which I wrote coordinates on each mat. Students worked together to decode the directional language and ensure they coded the correct sequence of directions into the Bee-Bot to move around then mat. On each challenge card was a QR Code that students could scan once they completed each challenge to see if they were successful. Students were paired together to create their own map. They designed their map on A4 grid paper. Their map needed to include a compass and coordinates. Students create three of their own challenge cards. Students then tested out each others creations to see if their challenges worked. We invited our parents into the classroom to share this learning experience. Parents were now the students and the students shared their learning journey and process of learning with their parents. This is a very resourceful way to integrate bee bots into other lessons. We had a successful idea too, where we used bee bits & trailers to collect little cards with graphics & French words, from shops (boxes decorated as French shops) using a shopping list. It reinforced the French vocal as well as lots of digital tech skills & fun! Thank you! I really enjoyed reading this and it’s great to see the steps in such detail. Loved the way parents and carers were involved! Great post Eleni.